Saturday night was a very proud night for Regina O Leary as she accepted a Special Achievement Award from the Irish Association of Youth Orchestras (IAYO) in recognition of 30 years of music by St Canice’s Instrumental Music Programme. 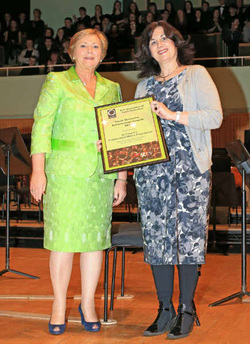 Minister for Children, Frances Fitzgerald, presented Regina with the award onstage at the annual Festival of Youth Orchestras Concert at the National Concert Hall in recognition of the contribution the music programme has made to the development of youth orchestras. Since the foundation of the programme in 1983, thousands of Kilkenny children have been given the opportunity to learn how to play a musical instrument and to enjoy playing music. The IAYO make two special annual awards to organisations who have made a significant and innovative contribution to the development of their youth orchestras. The Special Achievement Award was presented to the programme for a year of celebrations to mark the 30th anniversary which included the creation of our wonderful new website (by parent Kate O’Connell) and the very successful Gala Concert in the Watergate Theatre in June 2013. Speaking after the presentation of the award, Regina said the programme is a testament to the dedicated music teachers team, our wonderful and supportive principal Maria Comerford and teaching staff, the unprecedented commitment given by amazing Parents’ Committees both present and past and the gifted talented children who have passed through the doors of St Canice’s over the past 30 years. Finally she said that the young musicians of St Canice’s have given her 30 years of unimaginable joy and long may it continue!